Paul O’Connell has played his last game for Ireland. Unable to walk, with searing pain shooting up his leg, Paul O’Connell was “beaming from ear to ear” – even though his World Cup and Test career were shot to pieces. Never again would O’Connell don his nation’s green, not against Argentina in the quarter-finals one week later, nor even to lead Ireland in a potential World Cup last-four debut. The indomitable lock knew his fate, deep in his heart, even if all around him were refusing to accept the worst. Ireland’s talisman captain should have been licking his wounds and mourning his international passing in the bowels of the Millennium Stadium. 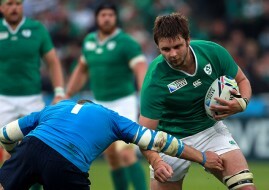 But Ireland had just seen off France 24-9 in their biggest victory over Les Bleus since 1975. So even if O’Connell had to be carried from the field, and even if the Munster stalwart had exited the Test arena for the final time, somehow the 35-year-old still summoned a smile to light up Ireland’s triumphant but shell-shocked dressing room. “At half-time it was mixed emotions, seeing your captain injured heavily,” said full-back Rob Kearney. “We felt awful for him but it was great to see the sheer delight on his face after the game in terms of what we’d achieved as opposed to feeling sorry for himself. “That was brilliant to see and a great sign of the man that he was able to put his own woes behind him and think of the team’s achievement first. “He was just delighted, he was beaming from ear to ear. Ireland’s totem almost since the day he stepped into Test rugby, making a debut in 2002 he cannot even remember despite scoring a try while concussed, O’Connell’s heart beats out the tub-thumping tune of Joe Schmidt’s squad. The Munster man’s fire and fervour inspired Ireland to otherwise-unreachable levels of passion and intensity. The 35-year-old is Ireland’s oldest captain of all time, Ireland’s oldest try-scorer of all time and only Brian O’Driscoll and Keith Wood have skippered the country on more occasions. Shrewd tactician Schmidt’s precise coaching methods are only truly balanced when Ireland hit their barnstorming best, as they did against France on Sunday. From the very first skirmish it was clear Ireland had produced their gold standard of the last two years and successive RBS 6 Nations title triumphs, and not their tentative and tepid offerings of the previous three World Cup weeks. O’Connell spearheads that mental desire, backed up ably by long-time Munster club-mate Peter O’Mahony. Munster captain O’Mahony’s World Cup-ending knee injury, when allied with O’Connell’s crushing blow, leaves a leadership and mentality vacuum Schmidt and his squad will do well to override. Ireland coped admirably without O’Connell in the second-half against France – but their spiritual leader had already set the stunning tone that pulverised Les Bleus’ resistance. New leaders and new hype men must emerge now, for Ireland to reach that long-overdue first World Cup semi-final. The pugnacious Pumas will not be shocked into tight-game submission as easily as Philippe Saint-Andre’s mystifyingly muddled France. O’Connell will join Cote d’Azur superpowers Toulon once his nasty hamstring problem is corrected. There will be suggestions his age ought to force a retirement. But this is a man enjoying the form of his life and doubtless hell-bent on one last career experience to weave into one of the richest rugby tapestries around. A statesman as skilled in second-row skulduggery as ambassadorial duty, O’Connell deserves so much more than to go out pounding the turf in anguish and agony. Let’s hope he can still make it for that Indian summer in Toulon.